LANCASTER, Pa. - Franklin & Marshall scored with 2:26 remaining in the game to break a tie, then held Lebanon Valley on a late charge to win 28-21 in the renewal of the two teams' rivalry. Meeting for the first time since 1982, the two went back and forth in their season opener, with all three Dutchman touchdowns coming on Tyler George catches. An hour and 48-minute thunderstorm delay at halftime split the game in two, and F&M capitalized with touchdowns in the third and fourth quarters to win. Brian Murphy threw for 198 yards and three touchdowns, all of them to George, who finished with 117 yards on seven catches to lead the offense. Both defenses were stout, with LVC limited to 297 yards overall and F&M 300. Frank Gaffney led the Dutchmen with 12 tackles and a sack, while Kevin Antol dropped nine tackles with three for a loss. 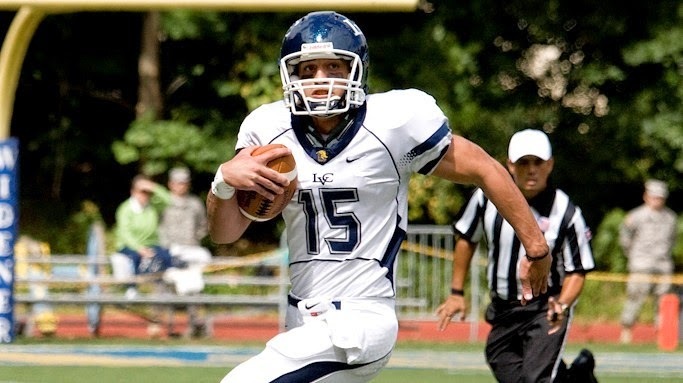 Bryan Ek came up with a key second-half interception that led to LVC's third touchdown. George opened the scoring with a 20-yard catch midway through the first, but F&M evened it up when Scott LaValva capped a long drive with a five-yard run to start the second. Quarterback Matt Magarity finished off an 11-play drive with 3:05 remaining in the half to put the Dips up 14-7, but LVC got the ball back and marched 79 yards downfield to score with no time left on George's 11-yard catch. The heavens opened at halftime and delayed the game nearly two hours, and after the restart it was F&M that struck first. Lamont Jackson broke free on a 30-yard run midway through the third to retake the lead, but Ek's interception set up George's 12-yard catch two drives later to tie it 21-21. LVC stopped F&M deep to start the fourth quarter but had to punt, and the Diplomats finished their series with Magarity's second touchdown, taking the lead with 2:26 remaining. With plenty of time to find an answer, Murphy completed passes to Mike Smith, Joe Bennett, and George before a Spencer Moser draw play put LVC on F&M's 14 yardline with 12 seconds to go. That would be as close as LVC came, however, as Murphy was forced to throw it away twice and then couldn't get it to a double-covered Darryl Sweeper in the end zone as time expired. Lebanon Valley opens at home next Saturday against Widener. LVC did not allow a sack ... Ek's interception was the game's only turnover ... George was the first Dutchman receiver to catch three touchdowns in a game since Tim Picerno did it at Wilkes in 2011 ... Irving and Moser each ran for 35 yards as the Dutchmen rushed only 24 times and was held to 99 yards on the ground ... FullbackBobby Conlon also had two rushes for 15 yards ... It was LVC's first weather delayed game since 2012 at home against Misericordia ... The loss snapped a three-game win streak in season openers ... F&M improved to 26-8-1 in the series ... The two teams are scheduled to meet three more times and will come to Annville in 2015.